We know, we know — it's hard to imagine eating anything but popsicles and ice cubes in this oppressive heat, but the new summer menu additions at Streeterville resto Markethouse will make you want to venture out of the a/c. The farm-to-table spot is beefing up their already delicious selection with dishes like Truffle Papardelle and Alaskan Halibut. 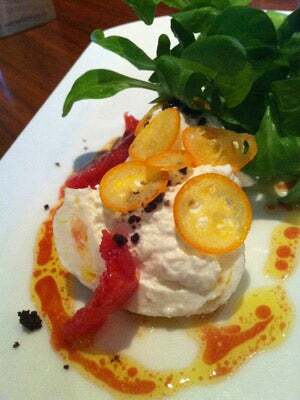 And, the Maple Brooks Burrata Cheese has our stomachs grumbling already — maché, blood orange, and kumquat are a perfectly refreshing combo. If you're looking for something a bit more adventurous, head over to South Loop spot Mercat a la Planxa, where they're offering seasonal tapas like grilled baby octopus, hickory smoked quail, and raw sheep's cheese. We can't think of a better way to spend a hot June afternoon than stuffing our faces with these summer-perfect bites. Bon appétit, indeed. Markethouse, 611 North Fairbanks Court (between Ontario and Ohio streets); 312-224-2200. Mercat a la Planxa, 638 South Michigan Avenue (at Balbo Avenue); 312-765-0524.